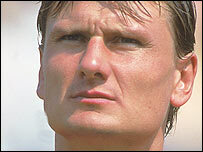 Torquay United have named former Czech international defender Lubos Kubik as their new manager. Kubik, 42, played in the 1990 World Cup for Czechoslovakia and also took part in the 1996 European Championships for the Czech Republic. Gulls chairman Chris Roberts has appointed him to try to guide Torquay away from the bottom of League Two. Kubik said: "Chris is my friend and I have come here to help him. I have a fresh start with the players." He added: "I did not have the chance to play here when I emigrated. I like football in England and the atmosphere and the people as well." Kubik played for Slavia Prague and almost joined Derby County in 1988 before moving to Italy with Fiorentina. He also had a spell with French club Metz, in Germany with Nuremburg and in the USA with Chicago Fire.